Being forward-thinking is second nature to those in the SEO industry. Following the latest trends and preparing for future algorithm changes is part and parcel of being a search marketer. As we head into the new year, it can be helpful to review what lies ahead. 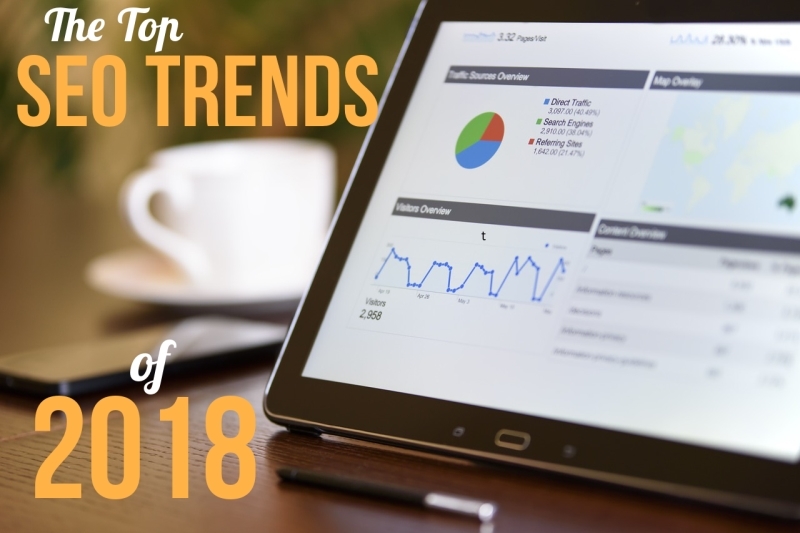 With this in mind, I asked SEO, content, and digital marketing professionals what they think will be the top SEO trends for 2018. They shared their ideas about what will be important and where to focus one’s efforts with regard to website optimization. Let’s get started! User engagement will be huge and quickly become the key metric marketers seek to improve. Due to that growth, the SEO trends that improve those metrics will also become increasingly popular. While quality links remain a critical factor, RankBrain will drive marketers to create more engaging content in order to maintain and grow their rankings. RankBrain is now Google’s third-most influential factor in determining page rankings. SEOs should pay attention to user engagement and experience signals like time on page, social shares of posts, and clicks to other content within a website. Improving social shares, having longer dwell times, and getting lower bounce rates will set any SEO up for success, and even more so if they can accomplish these feats on mobile devices. In 2018 mobile first indexing will play an extremely important role. While there’s no official launch date, its significant impact could change the way we compete for search results. If you aren’t already checking and prepping for optimized mobile speed, there’s a risk your SEO will take a major hit in the coming year. All subdomain mobile websites will be gone from search results. Brands and businesses will push more efforts towards a responsive design. We will start seeing more webmasters investing a lot of time optimizing for the ideal page loading time as well as AMP adoption for best user experience through mobile search results. I think the biggest search trends for 2018 are going to be optimizing your content for voice search and passive listening. As audio and video continue to grow in popularity, making your content passively consumable will help keep listeners on site and allow them to get more out of what you are saying. Voice search is rising, podcasts are becoming more popular, mobile traffic is growing, audio is taking over. Jump on the band wagon or get left behind. The trend that most likely will dominate 2018 is content optimized for voice search. Although how would SEOs achieve results is still unclear, many are looking for ways to dominate a new type of search that is gaining more users. Voice SEO will require a new look at how content is written (a new approach to keyword research and implementation) as I expect shorter articles answering one main question that serves as the targeted keyword. SEO in 2018 is going to be driven by Voice search technology. The use of digital assistants is making changing the way users search on Google. Presently 1 out of every 5 Google searches already come from voice queries. This new way of searching will encourage a varied SEO strategy, with a focus on natural language ad more long-tail search keyword. I believe we will see more voice search. Instead of typing online searches into Google on a computer, people will speak and ask queries verbally using their phone. It will become increasingly important for marketers to write content that addresses specific questions and is easy to understand. The best content will be colloquial in nature. Voice search will continue to grow in popularity, this is partly spurred on by the surge in sales of voice activated smart home devices such as Amazon Echo and Google Home. Voice search hasn’t yet made significant strides into ecommerce but 2018 could be the year it does. Also, how search engines go about delivering transactional content over voice will be interesting and could force retailers to change the way they present product information. Optimizing for voice searches is a great thing, especially if you consider how fast voice search is becoming mainstream. In the United States alone, almost half of the teens and 41% of adults use voice search daily. Tapping into this opportunity might be just what you need to excel in 2018. The Google Chrome team created the concept and original technical concepts a few years ago. The Google search team is enthusiastic about PWAs because they are all about delivering the best user experiences. PWAs use a magical mixture of the latest web platform features to make web sites load instantly, work offline and engage customers enough to add your icon to their mobile home screens. Microsoft is adding Progressive Web Applications to the Windows Store and using Bing to curate PWAs. If you want a way to elevate your online presence accessing platform features from your web site is definitely a great way. Now that all major browsers support the platform features that make PWA functionality native it is an opportunity for online marketers and businesses of all sizes to seize this opportunity to differentiate themselves from the competition and improve their search engine profiles. In October 2017, Google made SSL’s a necessity by creating security warnings for sites with form fills who didn’t have them. Now over 67% of first page ranking sites have an SSL. Those who don’t are losing ground as they get pushed farther back in the Search Engine Ranking Pages (SERP’s) due to their security risk. Google literally changed the behavior of companies with this change. The practice of optimizing site speed will be a continued trend in 2018. Considering the ever-increasing amount of searches on mobile, the emphasis on site speed and usability will become even more important. Along with that, the demand for developers who can creatively code without relying on plugins will rise. In 2018, the average user will have even higher expectations of websites and apps in terms of their functionality and ease of use in daily life. So in 2018, we’ll hear incessantly about the mobile first index. What no one will want to talk about is how an ever increasing amount of data is being used for video. Speed and video don’t always go hand in hand! While Google and other search engine’s get all the attention, Youtube is actually the 2nd most common search being used. Smart marketers are going to be both using video, but also learning how to optimize it. One of the next big steps in SEO is for it to expand beyond Google. In 2017, Google’s push to more aggressively monetize searches in formerly organic verticals reached new heights. Google Local Service ads expanded exponentially while Google Home products also began to reach the mainstream, which could soon serve up entirely ad-driven search results. Meanwhile, Amazon eclipsed Google’s product search reach in some markets and Amazon lowered their affiliate rates. Put these factors together and there are clear incentives for some SEO specialists to begin focusing less on Google SEO and more on Amazon SEO. Similar factors could also spur growth in YouTube SEO, and on other search engines. For those reasons, I fully expect to see more tools, agencies, and tactics catering to SEO on search engines besides Google throughout 2018. Optimizing for DuckDuckGo – DuckDuckGo has experienced massive growth in the past 2 years and I think that interest in ranking on their results will continue to grow, especially as privacy concerns increase. It will become increasingly important to target the feature snippets in 2018. Unlike organic search results, Google displays feature snippets to provide a snapshot of the best results. This creates a winner-takes-all scenario in which the company ranking in the top position earns the majority of the traffic. The nice thing about feature snippets for small businesses is you don’t have to be the number one organic result with a high Domain Authority to show up in the feature snippet. However, you do need to write excellent content that is well optimized in a Q&A style format. Google found a way to keep people longer by introducing the featured snippets. Now people don’t have to click on the search results anymore because the answer is already there. The “People also ask” box was also created with the same purpose. It gives you 4 results on related questions and every time you click on a question, 2 more appear. This way you can read a lot of content about a topic without l eaving G oogle. SEO experts need to focus on getting their clients’ pages on that featured snippet. In the local search space, the website will continue to be displaced by the Google My Business results as Google serves up the information people need about businesses directly on the result page. That’s why we’re including map result impressions and actions in our client dashboards; not all leads will even go to the website. More Rich Snippets – For the best user experience, Google will always try to display the relevant answer to the query right on the search results page if they can, such as in the form of answer box or rich snippets. Sites not taking advantage of this or optimizing for this will be severely left behind. As 2018 approaches, SEO specialists should focus on the user intent of search queries. If you’re able to understand the kinds of questions your users are asking, you can optimize your website content so that it directly answers those questions. Rather than focusing all your time on finding keywords, try creating content around those keywords. This will get your content closer to what users are actually searching for. Nothing is guaranteed in the world of search engine optimization. However, if your site architecture and technical elements are optimized, your content strategy is in place, and you’ve implemented an ongoing “white hat” link building campaign, it is far more likely you will see improvements in rankings. With the new push of AI in search and the evolution of Rankbrain, Google is looking for sites that meet the needs of its customers and users. Criteria include: Is it answering the user’s question? Is the site fast enough on mobile platforms? What options does the user have? How close in proximity is this business to the user? More than ever before, Marketers need to focus on their site, content, and technical SEO in 2018 more then ever before rather then focusing on trying to rank for specific keywords. In 2018, it will be even more important to focus on the user intent of search queries. If you’re able to understand the kinds of questions your users are asking, you can optimize your website content so that it directly answers those questions. Rather than focusing all your time on finding keywords, try creating content around those keywords. This will get your content closer to what users are actually searching for, and any variations. Relevant term association: The importance of having not only the terms that you are targeting but also terms that are also commonly used in context with that term. This will help search engines understand the meaning of the keyword in the context of the article and ensure that the content isn’t one dimensional. An example of this might be for the term “electrician.” Having the words “electricity” and “power” would increase the relevance of the target page significantly. This, along with content length, allows a page to be seen as more relevant and reduces the likelihood of it being seen as a spammy or generic article. I think one thing that you’ll start seeing as a way to get ahead with SEO in 2018 is more use of experts within a specific topic area to help with content creation. My reasoning is as follows – links are still a large ranking factor and I don’t see that changing by 2018. To get links naturally, one of the best ways is to create content that gets people talking and sharing. The problem is, more content then ever is being created (content shock – Mark Schaefer wrote about this). To be able to distinguish your content from all the other content that’s being pushed out, it’s no longer enough to just write well. People are looking for answers to their queries which requires at least a familiarity in the subject matter and at times will require expertise. This is why I think you’ll start seeing a greater trend of content being created by brands using topical experts who can share real insight on the subject that they’re discussing which in turn should help with obtaining more inbound links. One trend for 2018 is the focus on pillar content. Gone are the days when we could score rankings by simply writing one article on a keyword. Except for sites with very high authority, everyone needs to cover a topic in detail to rank for it. This means we need to consider keywords as topics and write a series of articles covering all the aspects of it. Once multiple articles covering a core topic are created we will need to weave them into a long-form post that acts as the pillar page holding all the supportive content. I’m preparing for what I believe will come in 2018 – the rising importance of quality citations. Getting citations from quality directories that screen potential candidates and allow for customized field inputs is much more challenging than sending out a push for automatically submitted information that goes to hundreds of websites. It should be assumed that search engines will soon identify these pushes for what they are – duplicate content. Citations have become easy to manipulate, but the significance of pushing out massive amounts of citations automatically should be expected to drastically reduce as we head into 2018. In 2018, digital marketers will increasingly realize that viewing “linkbuilding” as a distinct and separate tactic is an inefficient and wrong approach. Today, we know that the best links are those that have natural anchor text, appear on relevant and authoritative websites, and are included in the main content of a web page. As Matt Cutts, Google’s former head of its web spam team, frequently said, it’s important that links be natural and not merely appear to be natural. So, with this in mind, the industry should know that the best links are those that have always come as natural by-products of the work of publicity and PR teams. These marketers have always aimed to get coverage and mentions of companies and clients in articles and blogs. And that coverage and those mentions often come with natural links. I think one of the most interesting concepts is “linkless mentions” being a factor in search results. So getting people to positively talk about your brand without leaving a link is a ranking factor now too. You will want to really go all out with customer service in 2018 to prevent and/or fix negative reviews that may affect your rankings. I think the biggest trend in SEO in 2018 will be the push to create unique content around your consumer, where your consumer has the ability to generate content as well. Too often do brands make content which they think makes sense, but it actually doesn’t provide as much value as they think and in return they don’t receive as much traffic and shares. Having user generated content will play a large factor in 2018 for SEO and I can see video also contributing heavily to that matter as well. It is estimated that a video is worth 1.8million words, a far cry from the old adage that a picture is worth 1000 words. By 2019 it is estimated that video will represent over 80% of internet traffic, with a large proportion of that being via mobile. Viewed another way, the internet will support 3 trillion internet video minutes per month by 2020, which equates to 5 million years of video per month, or about 1 million video minutes every second. Say WHAT!? Additionally, the video messages are becoming shorter and smarter, with Facebook and YouTube offering video advertising spots for just 6 seconds. The format is also changing from the traditional horizontal size to square and vertical (and interestingly vertical videos actually perform better on Facebook). According to Simply Measured, video is shared 1,200% more than both links and text combined. So the moral of the story is – if you’re not using video as part of your online marketing strategy – you should be! In 2018, I think variety will be key, as will a focus on video and social media. Many old SEO strategies such as email the webmaster no longer work. Focusing on quality content that incorporates numerous types of media, including video, infographics, graphs, and custom images, will help earn links in 2018, and successful social media efforts to promote that content will become a stronger signal, as well as a means to earn links. SEO companies should be getting into video at this point, or partnering with firms that provide that service. Continue to deliver engaging content and make the user experience as positive as possible for readers. Make sure your site or the site you are working with is visually appealing, easy to navigate and filled with quality and engaging content. Google and other search engines have begun to move towards prioritizing excellent and relevant content. Google does not like it when people use black hat SEO tactics to earn a better search engine ranking that they do not deserve. They want websites with helpful and relevant content to be at the top of search engine result pages. I think, in 2018, Google and other search engines will continue to crack down on black hat SEO and reward good content. Because of this, people who do SEO as a profession will need to spend more time focused on creating content that is meaningful to your respective marketplace and target audience. Doing this makes SEO more straightforward because it’s what search engines are looking for in a top ranking website. You will have an easier time getting links and traffic to your website if the content is unique and provides something for your users. Creating great content will be a key trend in SEO and building an online presence in 2018. Having [nice-looking] graphics won’t be enough, because studies show that beautiful graphics without great content are not something people would like to look at. Turns out people prefer interesting data, and this tendency will grow bigger over time. Make your website as useful and relevant as possible. That has been Google’s core mission from the start. After Panda, Penguin, Hummingbird, etc., all their algorithm serves that purpose. Most people get distracted by all these changes that they forget about the main goal. Make your website as useful and relevant as possible. As you head into 2018, be sure to keep these SEO trends in mind. Doing so will make it more likely that your site will continue rising in rank for your target keywords. Stay ahead of the pack in search engines by sticking to what works and listening to the advice of the professionals in the SEO industry. Have a great 2018 everyone!